Machi Koro Keeps On Rolling! 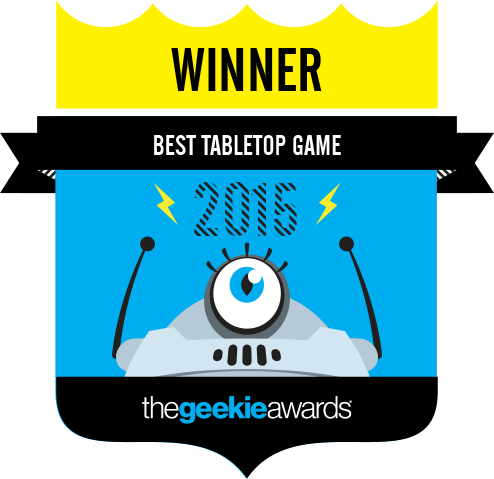 Machi Koro adds another award to its growing list of accolades, as it was officially announced as the Geekie Award’s Best Tabletop Game of 2015! At a presentation that included special guests Ernie Hudson and Kevin Smith, Machi Koro received the prestigious Geekie Award, beating out stiff competition in the form of four other excellent tabletop games. This continues the momentum of 2015’s breakout hit family game. In the past 12 months, Machi Koro has sold over 100,000 copies and is showing no signs of slowing down. With two expansions and a deluxe edition already on the market, the Japanese import continues to find ways to reach new audiences and bring more fun to its fans. ← IDW GAMES TO ADAPT TEENAGE MUTANT NINJA TURTLES INTO BIG BOX ADVENTURE BOARD GAME!